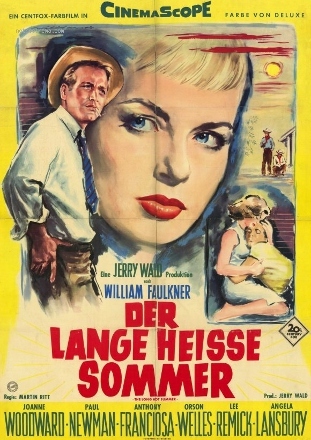 Featuring a pair of great lead performances by Paul Newman and Joanne Woodward---who would get married later that year, and stay married for another five decades----Martin Ritt's The Long, Hot Summer (1958) is a deep South melodrama that combines parts of three different William Faulkner stories with mixed results. Our story follows Ben Quick (Newman), who's been kicked out of a small Mississippi town for suspected barn-burning and eventually hitchhikes his way to rural Frenchman's Bend. It's unofficially ruled by wealthy Will Varner (Orson Welles), who owns just about everything...including the plantation Ben eventually lives on. Surprisingly, Ben and 61-year-old Will end up getting along. Varner sees a lot of his own ruthless temperament in the ambitious young man, or at least more than in his own son Jody (Anthony Franciosa) and unmarried daughter Clara (Woodward), who's been involved with mama's boy Alan Stewart (Richard Anderson) since she was a teenager. Not surprisingly, Varner attempts to control everything: he gives Ben more opportunities than Jody, and even sets him up with Clara as a thinly-veiled attempt to inject more testosterone into the Varner bloodline. Some of the pieces seem to fit better than others, but Varner nonetheless spends most of his time forcing round pegs into square holes. By the end of their brief and turbulent season together, Ben and the Varner family have undoubtedly changed for the better...even if some of The Long, Hot Summer's well-meaning resolutions feel just as forced in hindsight. Like his character's tendency to rule with an iron fist, Welles' shadow looms large over The Long, Hot Summer...perhaps too large, which remains my biggest gripe with an otherwise decent film. Welles is magnetic as Varner, chewing scenery while bringing the spark and friction that most melodramas need to keep things exciting, but the dominance of his character cripples the film's effectiveness in the home stretch. The Long, Hot Summer loses its focus at this point (or even earlier, due to its slightly overstuffed cast of characters): even at less than two hours in length, a good amount could've been trimmed without impacting the overall story. There are occasional moments of brilliance here, but the all-too-convenient decisions of certain characters---which feel like they were made to suit its story, rather than the other way around---give The Long, Hot Summer a slightly bitter aftertaste. In other words: it's more than entertaining most of the time and certainly easy to get wrapped up in, but won't linger in your mind for very long afterwards. Luckily, its most effective characters and top-notch cinematography still make The Long, Hot Summer worth a watch, even if you're not usually attracted to melodrama: the sparkling dialogue and overall atmosphere give the film a raw charisma that undoubtedly ruffled a few feathers back in 1958, even though its more problematic moments threaten to demote the film to "guilty pleasure" territory. But no matter why you enjoy the film, Twilight Time's Blu-ray offers a nice upgrade over Fox's 2003 DVD: featuring a strong A/V presentation and all of the old disc's bonus features, there's enough here to make it worth at least a once-over. Presented in its original Cinemascope (2.35:1) aspect ratio, this new 1080p transfer of The Long, Hot Summer is a rock-solid effort that easily eclipses Fox's impressive 2003 DVD. Image detail is striking at times, color reproduction is superb, shadow detail is consistently strong, and the steady, satisfying layer of light grain offers a pleasing texture; the end result often looks like a painting come to life, which really gives the film a uniquely satisfying appearance. The absence of digital imperfections is another big plus, which is partly due to excellent encoding and the limited bonus features. Fans of The Long, Hot Summer will undoubtedly be pleased from start to finish, whether your first exposure to the film was theatrically or through one of several home video releases. DISCLAIMER: The still images and screen captures on this page are decorative and do not represent the Blu-ray under review. The audio is presented in either DTS-HD Master Audio 5.1 or the original 2.0 Stereo track, both of which replicate the film's soundtrack with excellent clarity and no glaring defects. There isn't exactly a night-and-day difference between the two options: they're both capable efforts in their own right, with mild separation that doesn't feel exceptionally wide. Dialogue and background effects are well-balanced and rarely fight for attention. Optional English subtitles have been included during the main feature only, as well as a separate Isolated Music Track (presented in DTS-HD Master Audio 2.0) that showcases Alex North's excellent score. The interface is plain but perfectly functional, with quick loading time and the bare minimum of pre-menu distractions. This one-disc release arrives in a standard keepcase with striking cover artwork and a nice little Booklet featuring production stills, vintage promotional artwork, technical specifications, and the usual essay penned by Twilight Time's Julie Kirgo. Aside from the Isolated Music Score, the extras from Fox's 2003 DVD are ported over; these include a "Hollywood Backstories: The Long, Hot Summer" featurette (21:28), a vintage Fox Movietone Newsreel (2:01), and the film's titillating Trailer (2:37). A well-acted but ultimately uneven deep South melodrama, The Long, Hot Summer still manages to get by on raw charisma, committed performances, and top-notch cinematography. It's certainly no classic, but this lesser-known production is still easy to get lost in despite some of its obvious flaws. Twilight Time's welcome Blu-ray package gives the film a suitably stunning 1080p transfer with strong lossless audio, while the limited bonus features at least preserve what was included on Fox's 2003 DVD (and the new isolated music track pays fitting tribute to Alex North's jazzy score). Die-hard fans of The Long, Hot Summer will surely want to indulge, but newcomers should probably rent this one first. Mildly Recommended, if not more strongly once the stock eventually runs low.